We are delighted to announce the winner of the Janine Stone Young Interior Designer Award 2013 is: Helene Forrester-Wood for 36 Queen Street . The final year design student at Canterbury School of Architecture UCA, showcased an extraordinary visual and intellectual project which interrogated the news agenda and challenged boundaries. Her energy and dynamism shone through and she demonstrated a very agile and engaged understanding of her chosen subject. The delighted student said: ‘I am overjoyed to have won this fantastic competition. I am so excited to be working with Janine Stone and her design team, it will be a wonderful opportunity for me and I shall grab it with both hands’. The winner receives a £10,000 cash prize from Janine Stone and a six-month paid internship at the London studios of the company and the coveted first prize pewter cube trophy. Her university, Canterbury School of Architecture UCA, will also receive £1,000 of funds for books and equipment for the benefit of future students. 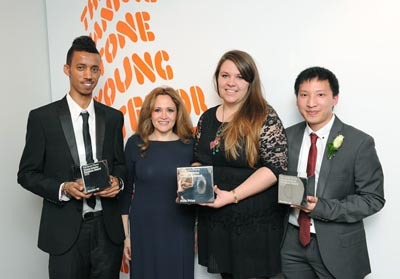 Left to right: Runner up Abdi Ali from The Univeristy of Westminster, Janine Stone, Winner Helene Forrester-Wood Canterbury School of Architecture UCA, Joint Runner up Michael Lau Canterbury School of Architecture UCA. The two runners up receive £1,000 cash prize each and both will receive a coveted pewter trophy. The competition was judged by an esteemed panel of experts drawn from the worlds of design, fashion, photography, education and business. Led by Janine Stone, the panel included the renowned photographer and portraitist, Terry O’Neill; the British fashion designer to A-list Hollywood, Alessandra Rich; the Prima Ballerina and Royal Opera House star, Leanne Benjamin; online publishing entrepreneur, Raoul Tawadey; Graeme Brooker, Director of academic group, Interior Educators and Lecturer at Middlesex University and the President of The Society of British Interior Design (SBID). Janine Stone commented: ‘Helene’s winning design is an exciting evocation of her university’s Brief. The Panel and I particularly liked the extraordinary visualisation and her hand-drawing abilities. It is a well deserved win. I was thrilled to see a huge increase in submissions this year, the field was of a very high standard and finding just12 finalists from such a large number of submissions was a significant challenge for the judges. I would like to extend my gratitude to all Course Directors and Tutors across the UK who supported YIDA 2013’. The Runners-up are: Abdi Ali for his work, The Communal Collection Hub from the University of Westminster and Michael Lau from Canterbury School of Architecture UCA for his work entitled: Herbal Remedies.